Burton & Company rapidly completes many REO and foreclosure appraisals for national clients. 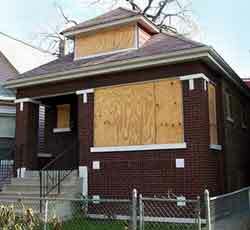 Foreclosure property appraisals are different than lending appraisals. For a property in foreclosure, you need to know the difference between fair market value and "quick disposition" value. An assessment of repairs needed to market the property is needed. If the property is vacant, it may have been neglected or vandalized. Maintenance levels on REO and foreclosure properties are typically lower. We accurately estimate needed repairs to make a property marketable, within the scope of our training. For a property that has already reverted to REO, you need a quick disposition. Four values are typically provided: "As-is", and "as repaired" for typical marketing time and and "as is" and "as repaired" a quick sale. This is usually 90 days or less. These represent the value with no work completed, with repairs required market the property similar to competing properties in the area, and, with no repairs -- selling the property very quickly, as a "fixer-upper." We will document all repairs needed with photographs and cost estimates, within our expertise. We will recommend any appropriate property inspections. We will research active listings and the absorption rate in the market for a true, current value. However you order, we will confirm the order immediately. We use absolutely most current sales, listings & pending sales to "nail" the true value of the property. We correctly analyze price trends (up or down), days on market, number of competing properties, and the true market reaction to the condition of the subject property. We correctly research and adjust for comparable sales concessions. We do this with quick turn times and frequent status updates.